Although Nords intermingled with other races over the years, it is primarily to Atmora, the northernmost known place on Nirn, that they trace their lineage. Atmora is likely a human corruption of "Altmora", a name found in old Elvish records which means "Elder Wood". Legends say that Atmora was once very green and prosperous, until "the freezing" turned it into an inhospitable wasteland plagued by civil war, causing its people to migrate to Tamriel in waves throughout the Merethic and First eras. During this migration, the chieftain Ysgramor rallied people from all sides who desired to live in peace and set sail south, eventually arriving at Hsaarik Head, at the extreme northern tip of Skyrim's Broken Cape. They named the new land "Mereth" in tribute to the Aldmeri Elves who had already settled most of the continent. Contrary to many stories, which apparently credit Ysgramor with being the leader of the first group of human settlers, he and his colonists were the latest in a long line of emigrants from Atmora to Skyrim, and many had already migrated to other places around Tamriel. Elves and men lived in relative peace and prosperity for a great deal of time, but racial tensions grew along with the human population, and eventually violence erupted. It's unclear how it started, but the Elves razed the Nordic capital city of Saarthal, killing the defenders and everyone unable to flee, in a slaughter now known as the Night of Tears. 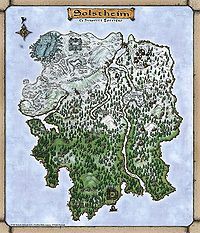 According to legend, the only humans to survive were Ysgramor and his two sons, who fled back to Atmora, where they gathered the famous Five Hundred Companions and sailed back to expediently slaughter any Elves they came across, founding new cities as they went and clearing the way for new settlers. During this time, the Nords also frequently waged war with the various Giant clans of Skyrim and Ysgramor purportedly slaughtered hundreds of Giants himself. Despite these early conflicts, the presence of Giants remained throughout the province in the eras that followed, although both races largely kept to themselves. The Five Hundred's great achievements and acts of heroism cemented them and their leader Ysgramor as role models in Nordic culture. Their legacy is purportedly carried on by the Companions, a group of nonpartisan mercenaries who are renowned as impartial arbiters on matters on honor. Ysgramor's descendant King Harald, who is credited with first uniting the province under its customary borders in 1E 113, drove the last of the Elves out of the province in 1E 143. Despite heavy resistance, Elves were also driven from Solstheim, a small island northeast of Skyrim, which would be predominantly inhabited by Nords for thousands of years to come. Dragons were revered as part of the Nordic religion. Dragon priests, on par with kings in terms of the power they wielded, acted as intermediaries between the people and the serpentine "god-kings", whose name could not even be uttered by the common folk. Temples were built to honor and appease the dragons, many of which survive today as ancient ruins haunted by draugr and undead dragon priests. The dragon priests in Tamriel became more tyrannical and the populace eventually rebelled some time in the Merethic Era, leading to the legendary Dragon War. Some dragons turned against their own kind and taught the Nords powerful magic that allowed them to turn the tide of the war in their favor. After a long and bloody campaign, the rule of the dragons was ended, and the remaining wyrms fled to remote areas. The Dragon Cult survived for a time, but was marginalized and eventually died out. Other traditional Nordic beliefs, known as the Old Ways, continued on, and remained prevalent among Nords even after the introduction of the Divines. In 1E 241, King Vrage the Gifted (Harald's son) began the aggressive expansion now known as the Skyrim Conquests, which would culminate in the First Empire of the Nords. Within a span of fifty years, the descendants of Ysgramor ruled all of northern Tamriel, including most of present-day High Rock and the whole of Morrowind. Some Nord leaders wanted to turn south to Cyrodiil, but the Jerall Mountains proved to be too big a barrier, and northern Cyrodiil too poor a prize. Over the next few centuries, Skyrim expanded and contracted as battles were won and lost. The Conquests, and the Empire, came to an end in 1E 369 with the death of King Borgas, the last of the Ysgramor line, during the Wild Hunt. When the ruling council or Moot was unable to choose Jarl Hanse of Winterhold (considered the obvious choice by Imperial scholars), as the new High King, the ensuing civil war tore the Empire apart. 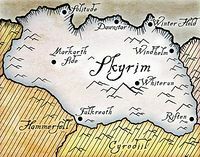 The war concluded in 1E 420 with the Pact of Chieftains, but the Empire lost its holdings in High Rock and Morrowind, and Skyrim was divided into independent kingdoms. The Nords tried to reconquer Morrowind around 1E 700, but were rebuffed by united Chimer and Dwemer forces, and the Tribunal would protect Morrowind from invasion for thousands of years to come. 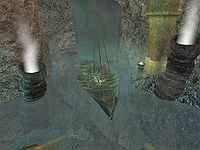 The failure of the Nord Tongues in Morrowind prompted Jurgen Windcaller to begin a seven-year meditation to understand the failure, leading to the discovery of the Way of the Voice. Late in the First Era, an invasion from Akavir cut through Skyrim. Even though Nords don't "meet invasions with pitchers of mead", they were unable to stop the mighty Akaviri Dragonguard, and it took the united armies of Cyrodiil to stop their advance at the Battle of Pale Pass. The Nords were understandably impressed, and for the first time, the whole of Skyrim pledged allegiance to one man: Reman Cyrodiil, one of the first Dragonborn recorded in history and the founder of the Second Empire of Man. The Nords would generally support the Empire, even under the Potentates, for hundreds of years to come. The chaos of the Interregnum brought the Nords an opportunity for glorious battle against their neighbors. Together with the Bretons of High Rock, they once again looked south, to Cyrodiil, for room to expand. Despite some initial success, they did not count on Tiber Septim. Skyrim was absorbed comparatively peacefully into the empire of Tiber Septim, the Battle of Sancre Tor around 2E 852 and other clashes notwithstanding. Many Nords found employment in the Imperial Legion, as Talos generally nurtured relations with the north. In the centuries after the Empire's founding, Skyrim was drawn into several major conflicts. One of these was the War of the Red Diamond wherein Skyrim supported Queen Potema against the Empire. The civil war nearly tore the Empire apart and it would take seventeen long years before Potema was finally defeated and peace was restored. However, a strong underground movement called the Hörme, believing that Potema and her deposed son were the last of Tiber Septim's true blood, continued to work against Imperial interests in Skyrim. Close to the end of the Third Era, the kingdoms of Skyrim instigated several wars to expand their territory. The War of the Bend'r-Mahk during the Imperial Simulacrum increased Nordic holdings considerably, swallowing up many miles of territory traditionally belonging to eastern High Rock and Hammerfell, and they have their eyes on Morrowind, which is no longer protected by the Tribunal. The Fourth Era brought significant changes for Nords. Late in the Third Era and in the beginning years of the Fourth Era, Solstheim became overrun by Dunmer refugees from Morrowind, which had been devastated by natural disasters and then invaded by the Argonians of Black Marsh who had already conquered much of Morrowind. The Nords of Solstheim wanted to win independence from the Empire, and planned to destroy Fort Frostmoth. Many Dunmer also fled west on the mainland, establishing a strong presence in cities in eastern Skyrim. Following the sacking of Nova Orsinium, many Orc refugees were escorted into Skyrim by the Imperial Legion. Many Orcs choose to segregate their society and live in Orc Strongholds scattered throughout the wilderness, but some others have, like the Dunmer, chosen to live in the "civilized" settlements of Skyrim. Despite some trepidation at these newcomers, the Nords remained relatively peaceful and prosperous, with some exceptions, in the tumultuous aftermath of the Oblivion Crisis. However, their peace would not last. Around 4E 200, a little over twenty years after the Great War ended, the High King of Skyrim was killed. A disagreement over whether his death was murder or the result of an honorable duel, combined with resentments created by the White-Gold Concordat which ended the Great War, launched Skyrim into the bloody Stormcloak Rebellion, named after the leader of the rebels, Jarl Ulfric Stormcloak. Even more disturbing was the return of Alduin, the ancient enemy from the Dragon War who had led the massacres against them, which Nordic religion had long held would herald the end of the world. There are two things most Nords love: music and mead. Most Nords wear animal skins or cotton clothing. They are generally tolerant of outsiders to Skyrim, though often do not make them feel welcome. In particular, Nords often still hold a bitter resentment towards elves. The Reach, one of the nine Holds of Skyrim, has only a slight Nord majority, and cities in the east have become heavily influenced by the Dunmer. The northern and eastern holds - Winterhold, Eastmarch, the Rift, and the Pale - are known collectively as the Old Holds, where the influence of old Nordic traditions is still relatively strong and outsiders are rare. The young men there go out for weeks into the high peaks in the dead of winter, hunting the ice wraiths that give them claim to full status as citizens. The Reach and the Rift both have long histories of lawlessness, and are generally associated with criminal activity. Nords tend to be superstitious, and their folklore reflects this. Nordic names, often chosen based on omens, are given in a special ceremony when the child is young. Any unexplained misfortune is often blamed on the Falmer, or Snow Elves. The Falmer, long believed to be extinct after the vengeful Nordic invasion into their lands, caused by the aggressive Falmer response to the new Atmoran inhabitants, were actually driven deep underground, where they became feral and purportedly seek to kill all those who dwell above them, so it's possible there's truth in some of these claims. Nords are known as masters of wood and timber construction. 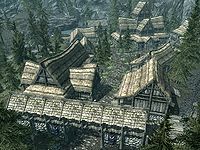 Besides the cities of Skyrim, their architectural style is reflected in Bruma, situated in northern Cyrodiil. Nord buildings are built partly underground to conserve heat, and are made with stones, with wood used only for support, and roofs of straw above the wood. These houses are essential to keep in heat in the freezing climate. Similar designs are also seen in Solstheim. Nordic buildings are known for being able to withstand the harshest elements for thousands of years. Old Fort, one of the royal bastions constructed by the First Empire to guard its southern frontier, is a fine example: "towering walls of huge, irregular porphyry blocks fit together without seam or mortar" have stood since the First Era. The Nords are considered to be a devout people with grim religious beliefs. Among other things, they have long believed that Alduin, the World-Eater, would eventually return and bring about the end of the world. As dark as their belief systems are viewed to be, all Nordic traditions extend one bright, shining hope for Nords: Sovngarde, the Hall of Valor, where Nords who have proven their mettle in battle or died valiantly are welcome to experience euphoric bliss and camaraderie, free from time and boredom. Some stories claim the place was built by, and still inhabited by, the elusive Shor. It is little surprise that cowardice is the worst trait a Nord can exhibit, for "a Nord is judged not by the manner in which he lived, but the manner in which he died". Ysgramor and the Atmorans brought with them the worship of animal gods: the hawk, wolf, snake, moth, owl, whale, bear, fox, and most importantly the dragon. Over time, as Nord beliefs evolved, the traditional Nordic Pantheon of Divines emerged as personifications of natural forces and ideas. Many scholars believe that the Nordic Pantheon is the same as the orthodox pantheon, merely with different names (there are certainly many parallels), and many Nords who have adopted the Divines evidently have this understanding. The isolated Nordic tribe in Solstheim, the Skaal, carry on a tradition very similar to the old tradition of animal worship. The Skaal venerate all of nature, believing that certain parts of their environment, such as the winds, the trees and the sun, were given to them by the All-Maker, a benevolent, unknowable creator deity. Wolves and bears are especially sacred to the small tribe. All aspects of nature must constantly be in harmony, for this is what gives the Skaal their shamanic powers. The Skaal also tell tales of the Adversary, the enemy of mankind, and his lieutenant, the Greedy Man. Tales suggest that the Greedy Man is another incarnation of Lorkhan, this time cast as a demon, and the Adversary is likely the Padomay/Sithis of the north, which gives birth to Lorkhan in elven tales. In this regard, the faith of the Skaal is nearly the opposite of the pantheon of their kin in Skyrim. 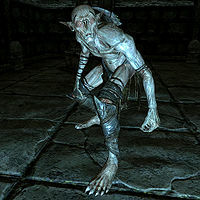 Although not worshipping them, the Skaal also acknowledge the existence of the Daedric Princes. 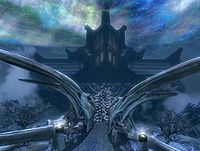 The Hall of Valor in Sovngarde, the Nordic afterlife. It is a huge mead-hall which houses the souls of honorable heroes, by will of Shor. Like most modern Tamrielic races, Nordic religion is focused on the Aedra and their old ally, Lorkhan. However, the Nord's Sky Goddess Kyne is notably more assertive and warlike than the nature-loving Kynareth. Although Mara is present in her role as a mother goddess, she is thought of as a mere handmaiden to Kyne, the actual mother of the Nords and the widow to Shor. She is also credited with sending her son Morihaus (and perhaps Pelinal) to the aid of the Cyro-Nordic slaves in their uprising against the Ayleids around 1E 242. Shortly after, the Nordic pantheon of gods would be fused with the Aldmeri pantheon by Alessia into the Eight Divines (although this new belief system would be bucked occasionally). Interestingly, certain Daedra, notably Hermaeus Mora, are found in the Nordic pantheon. The former chief of the Nordic pantheon of Skyrim is Shor. He was the king of the gods and a champion of men in their struggles against the Elves, until being treacherously slain by elven devils, and consigned to serve as god of the underworld. But even still he continues to bestow favor on his people by aiding them with immortal champions, sometimes called Shezarrines, including Ysmir, another member of the Nordic pantheon. Shor was left out of the Eight Divines, but is still represented in a way acceptable to some Nords as "the spirit behind all human undertaking" in the Cyrodilic pantheon. Shor, and Shezarr, are suspected to be the same entity as Lorkhan. The traditional Nordic pantheon has had a very muddled history with Akatosh, the Dragon God of Time, and misconceptions abound. The totem animals of the Old Ways included the dragon, whom scholars correlate with the worship of Akatosh, but the veneration of dragons understandably dwindled among Nords after the Dragon War. The Nords of the First Era thus only came to know Akatosh as Auri-El, the Elven deity, whom they demonized. Nevertheless, Akatosh was reintroduced in Alessia's compromised pantheon. Many scholars over the years, most of whom were foreigners unfamiliar with the nuances of Nordic history, have mistakenly assumed that Alduin was merely the Nordic name for Akatosh. Due to mistrust of Nordic education and the integrity of their oral traditions, even well-informed scholars dismissed the dichotomy despite the fact that Akatosh's benevolent nature bore no resemblance to Alduin and that Nords who accepted Akatosh as a deity maintained that he was distinct from Alduin. The spiritual relationship between the Nords and breath is crucial to understanding Nordic beliefs and motivations. They believe Kyne breathed life into them at the Throat of the World, the highest mountain in Skyrim. Another creation myth involves the Ehlnofey, wandering progenitors of the Mythic Era, some of whom were displaced to Atmora during the Ehlnofey wars of the Dawn Era and became the Nords. The two stories are not necessarily in conflict, as they both seem to suggest that Nordic ancestors emerged in Skyrim, flourished in Atmora, then returned. Regardless, the Nords believe that their breath and voice are their vital essence, and that by uttering shouts in the tongue of the dragons, they can channel their essence to perform incredible feats. Nords have been able to use the thu'um, a magical shout capable of extraordinary power, as a nearly unstoppable weapon against their adversaries as far back as the late Mythic Era. They view it as a gift from Kyne, and those with the talent to wield it are called "Tongues". The ancient Greybeards, masters of the thu'um, still sit atop the 7000 steps leading to the settlement of High Hrothgar, near the summit of the Throat of the World, where they practice the Way of the Voice. Their leader, Jurgen Windcaller, brought about a ban on the use of the thu'um outside of times of "True Need". Tiber Septim established the Imperial College of the Voice in Markarth in an attempt to turn the Way of the Voice to warfare. While some Tongues like Ulfric Stormcloak have proved willing to use the thu'um for violence, the use of the thu'um in warfare has remained extremely rare among Nords. It is false to assume, however, that the Way of the Voice demands pacifism: while the Greybeards don't take up arms directly, they occasionally speak, and thereby set titanic events in motion. They have spoken together on only two known occasions: to announce the destiny of Tiber Septim and, later, to do the same for the Last Dragonborn. Today, Ysmir is the name by which Nords recognize the divinity of Talos, and may be used more generally to refer to any Shezarrine. However, there are many competing theories on who or what Ysmir really is. The title seemed to have originated with Ysmir Wulfharth, the Atmoran-born ruler of ancient Skyrim whose thu'um was so powerful that he could not speak without causing destruction. This is actually rather typical of the greatest masters (powerful Tongues are often gagged for safety). In Nordic society, the Dragonborn is an archetype for what a Nord should be, and any Dragonborn is treated with a deep respect. A Dragonborn can not only wield the power of the thu'um like other Tongues, but can also absorb the souls of dragons, as well as knowledge of the thu'um, thereby achieving in a short time what it takes others a lifetime to learn. The "Dragonborn Emperors" were able to rely on this cultural influence to cement the fealty of the Nords, while the Emperors of the Fourth Era were not. It is likely because of this that so many Nords are unwilling to give up the worship of Talos, even in the face of a ban by the Empire. For Nord names, see here. ^ a b The Etched Tablets of High Hrothgar. ^ Rumors heard during the Oblivion Crisis. This page was last modified on 13 March 2019, at 20:59.